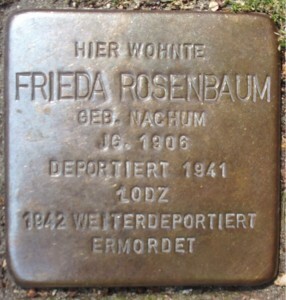 Sweet Frida sounds out letters, makes them into names, makes them into people once again, the Stolpersteine. One she hasn’t seen is hers: her name, misspelled with an extra E; her end, miswritten. (It has to be.) It is on the West side of town. I saw a picture of it on the internet. 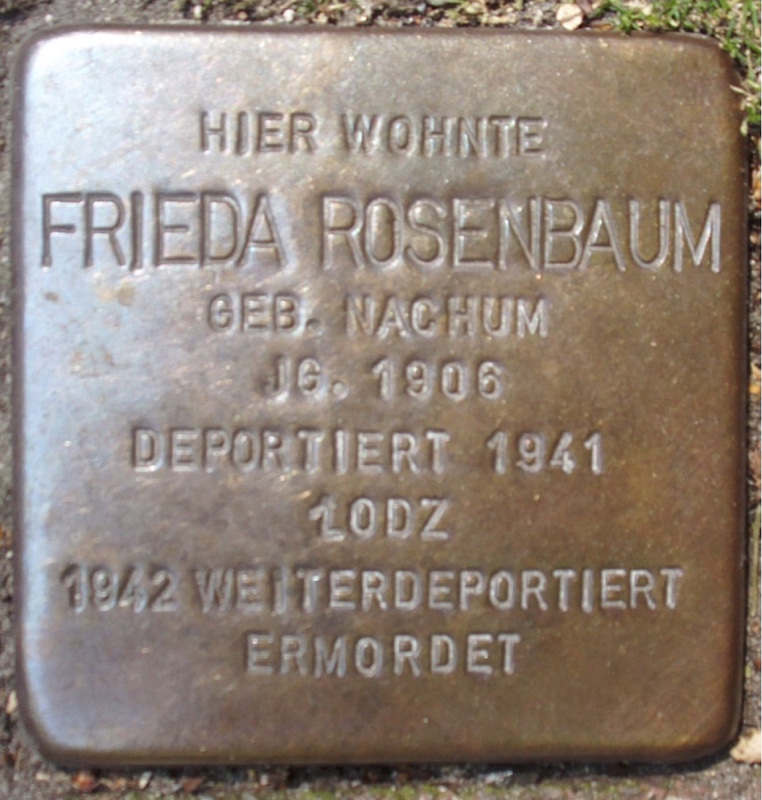 The Stolpersteine are everywhere. Outside the tennis courts, in front of the orthopedist’s office, two doors down from the nursery. They are in fancy neighborhoods, in poor neighborhoods, in my neighborhood, everywhere. These neighbors had so many neighbors. The whole city lived next door to a Jew. The whole city! How could they let this happen? How could so many people – millions – let their neighbors be taken away? I thought that Jewish people lived in Jewish ghettos and that the ghettos were emptied into concentration camps. Incorrect. The Jewish people were not concentrated before the camps, they were everywhere – a part of the fabric of society. There were seders, and menorahs, and dreidel in a living room on every block in the city. Our name is beautiful in German. What a shame. Now there is our little Frida, a Rosenbaum, reading so well that I have to tell her father not to brag about it. (It is so easy for her we cannot possibly take credit.) She eats her pumpkin, she carefully breaks eggs right over the middle of the bowl, she is tall and strong and incredibly serious for a four-year-old. She speaks three languages fluently, she likes walnuts, she says fish is her favorite food. When she sits in the sun and reads names, she is delighted. “Otto Spiro!” she says. She listens carefully when I tell her about the dead people and the awful war. (We say awful war because we are not born knowing about war’s intrinsic horrors. When we are four and lucky we have to be told that it is awful.) Frida listens, she thinks, she moves on. Five minutes later she is lobbying for ice cream after dinner. Late that night she wakes up with her first headache. It is sad to remember the Holocaust, and sad to teach my daughter about it. I feel lonely here without my people; in Germany I am a stranger in large part because my family had to leave or die and it is difficult to come back after so many generations away. I was so ready to fight before I had kids. Convinced of my convictions, angry at the neighbors for letting their neighbors go. I was, am, shocked at how personal the murder of strangers can feel. Now, in these sad-proud-sunny-happy moments on the sidewalk with Frida, I am grateful that I’m so focused on a complex, profound, life and death topic that is not Max’s heart or his interrupted brainwaves or his chromosomes. Max’s problems are an unhappy accident rather than deliberate cruelty. Being reminded of that makes helping him more joyful, less depressing. 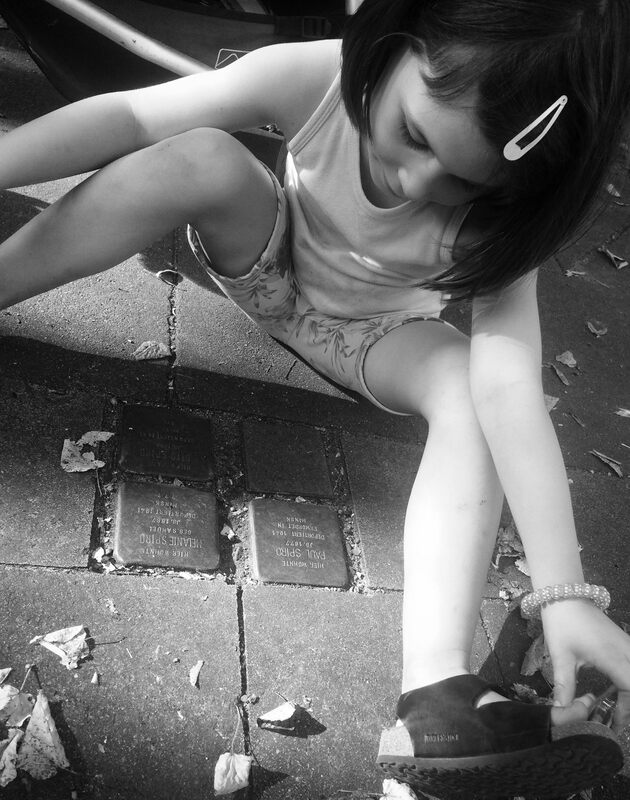 This is the best I can do: with him, with the Stolpersteine. Frida : The world is my what? 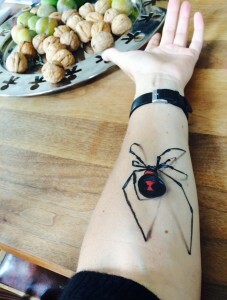 I am a novice face/arm painter but there’s nothing like carefully following the instructions on a YouTube video to make you wonder if you have some natural talent. Hint: the secret to dramatic spider shadows? Black eyeshadow and not wondering which direction the light is coming from. Based on the reaction I’ve gotten so far here in Hamburg, I will not be repeating this on my face as planned. Reactions range from disdainfully raised eyebrows (husband), to quietly ignoring it (friend), to saying “Wow” several times and then asking when I will wash it off (Frida). Max, for some reason, looked at it worriedly and then asked for a cupcake.